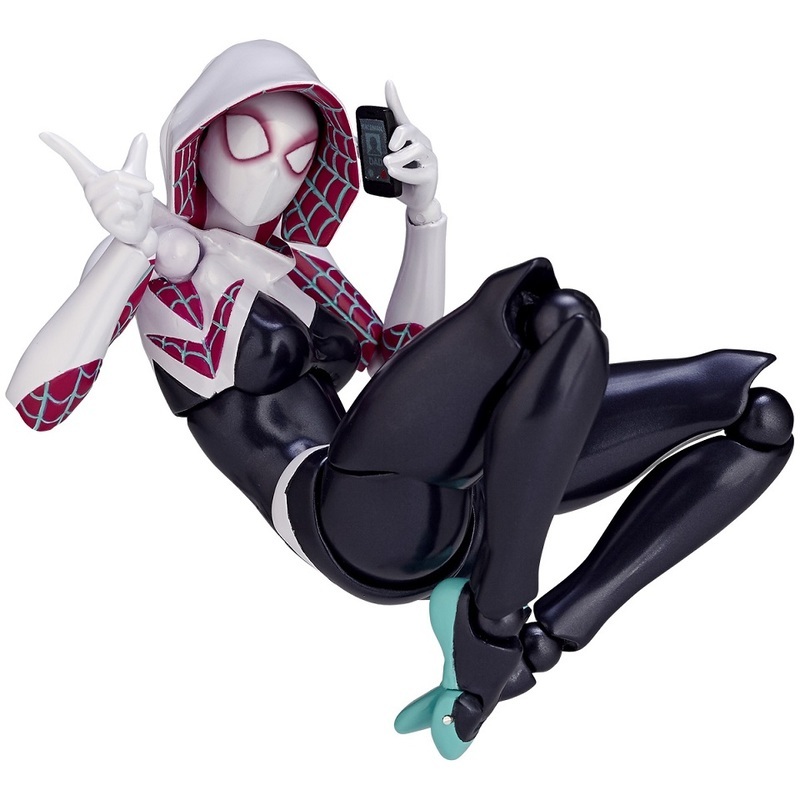 A few new official photos have been released for the upcoming Marvel Comics – Figure Complex Spider-Gwen Revoltech Figure. Tag Hobby has posted the images. 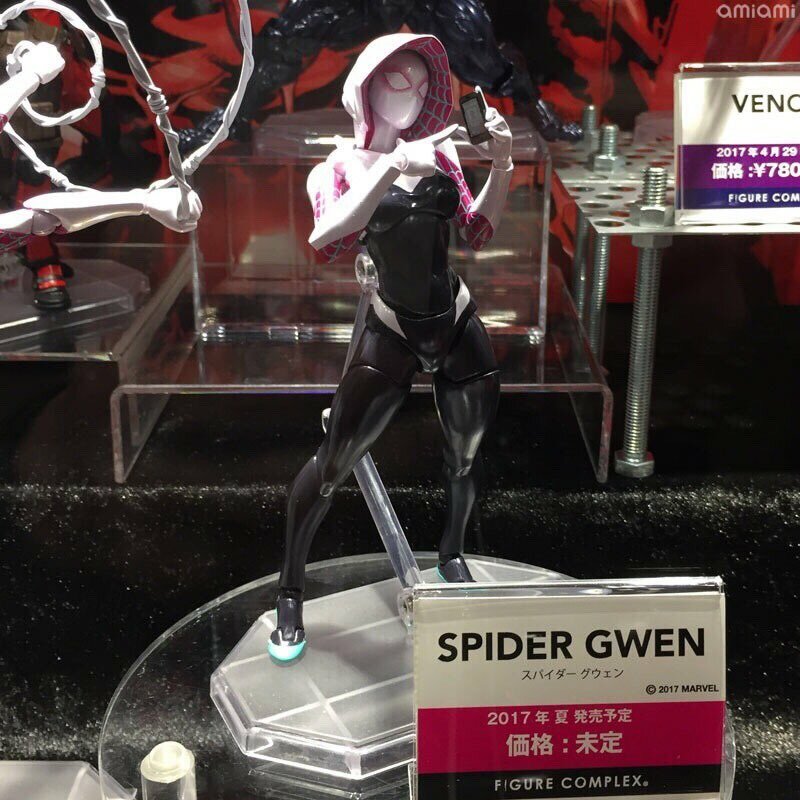 The new Spider-Gwen figure made her debut at Winter wonder Festival last weekend, along with a Revoltech Wolverine. 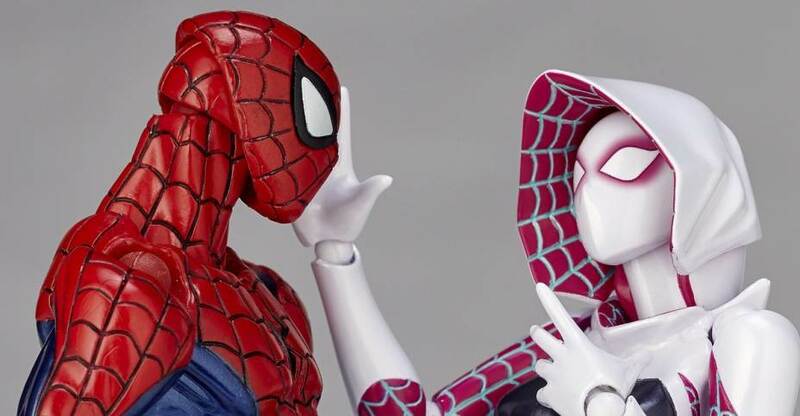 The Spider-Gwen Revoltech Figure includes a masked head with wide eyes, one with squinting eyes and an unmasked head. also included is a cellphone, multiple interchangeable hands and webbing effects. 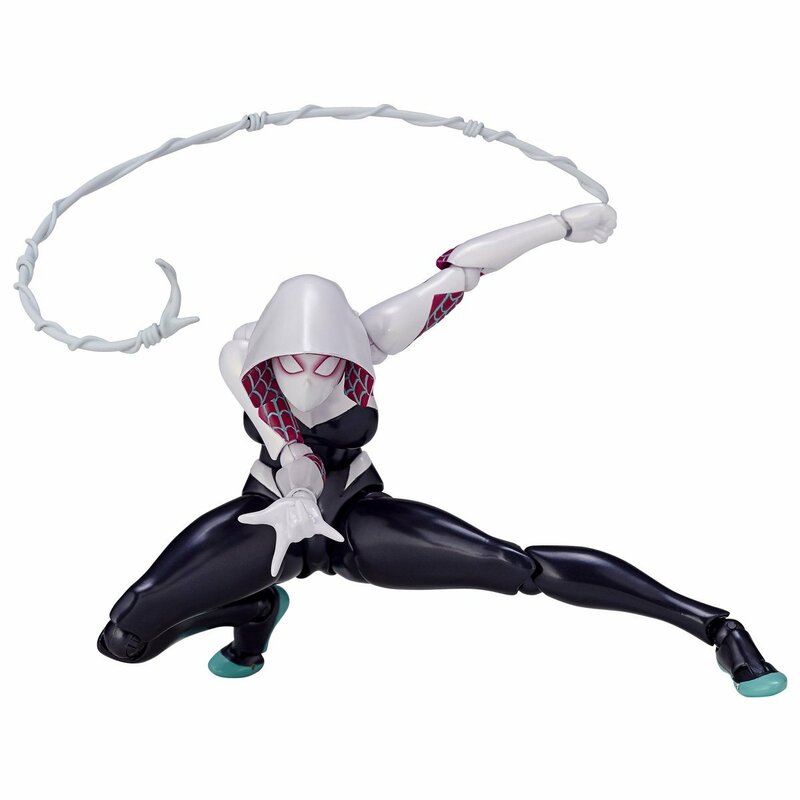 She will stand just over 6 inches tall and will be fully articulated to recreate her web swinging and wall-crawling poses. The figure is due out in June at a price of 5,800 Yen (about $52 USD). Check out the new photos after the jump. I honestly must say this is the best-looking of these revoltechs. She can stand up straight/in a more neutral, natural pose (I know it's stylized but it's the same thing), and the joints are not nearly as intimidating. Not really sure why this character is so popular for. She looks cool and thats it. I haven't read Spiderman since the Spider-Verse Arch where she was introduced. Not really sure why this character is so popular for. For being a genderbend Spider-Man with a pretty costume. And no, I don't get it either. Not really sure why this character is so popular for...I haven't read Spiderman since the Spider-Verse Arch where she was introduced. So you don't understand why a character whose comic you don't read is popular? Hmm. Well at least you read the arc where she was introduced. She's just Gwen Stacy as Spider-Man with a different dynamic, with a style that you love or hate (that I love) and ultimately is fun to read. It's another alternate storyline but adds depth to the spider identity as well as fleshing out characters we wouldn't usually get the exposure in the normal Spidey offerings. However, it isn't anything the blows the comic world into a new amazing depth. If the character didn't immediately appeal, then the character is likely not going to satisfy you even if you give her a fair shot. That said, I highly recommend the Volume 0 and 1 for her, since that style that reminds me of "edgy" early 2000's cartoons is nailed and done proper, and the character of Gwen Stacy is ultimately fun to engage with. I'm not really a fan of Revoltechs, as pretty much all my past experiences with the line has been rather negative. But this, this is tempting me so much. Just looking at the photo of the masked and un-masked figure/s I can't see any of my usual recent release issues, and it looks extremely poseable and able to take a natural standing pose. If it isn't too terrible price wise I'll easily place a pre-order. She looks really good just standing. I wonder if she's got the double jointed shoulders or single. Single looks better and doesn't lack movement range for me. Looks like there's a posed up one just out of frame with some really cool web effects. Hope some pictures of that one pop up. Looks like there's a posed up one just out of frame with some really cool web effects. Hope some pictures of that one pop up. Other sites already have pics of the posed one. In those other, better-lighting photos on other sites, you can kind of see she still has the signature double-jointed shoulders of this line so far. Though given how slender her arms are, one would hope they would at least try to hide the gap better. Only time will tell. I'm fairly excited about this Wolverine. I dislike both Deadpool and Spider-Man because of their Revo-ness, Venom is awesome but I don’t really want one without a Spider-Man of the same style, and Spider-Gwen is... Spider-Gwen. Meaning I couldn’t care less really. But this Wolverine looks pretty promising. MvC style bulk with what could be the blue and yellow costume and some really cool looking claws. Love it when they actually look like blades instead of pointy sticks. The costume also seems to hide the ugly Revoltech joints well, but of course we haven’t seen it in any crazy poses yet. If this continues to impress me though it might actually become my first Revoltech figure. That's a very cute face for Gwen. How many of these companies that do these types of Marvel figures, I've been leaning more towards these cause of how great they look. I know there's Play Arts Kai which I started getting into. 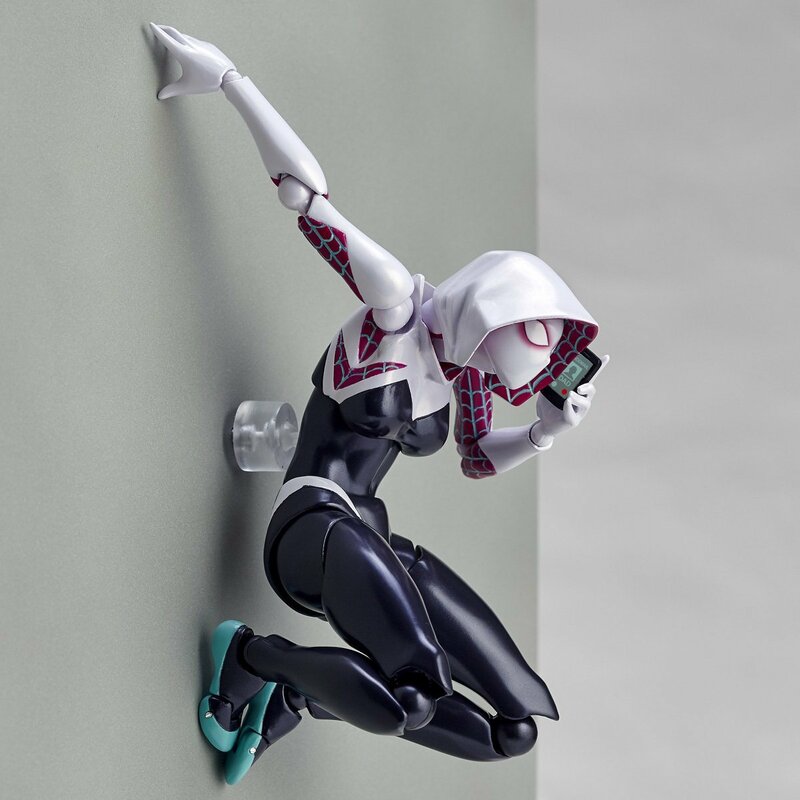 Ugh, now I wish I hadn't bought the Marvel Legends Spider-Gwen. I haven't bought a non-mecha or non-vehicle Revoltech since the first Fate/Stay Night Saber figure and it looked lousy. But Gwen looks great! 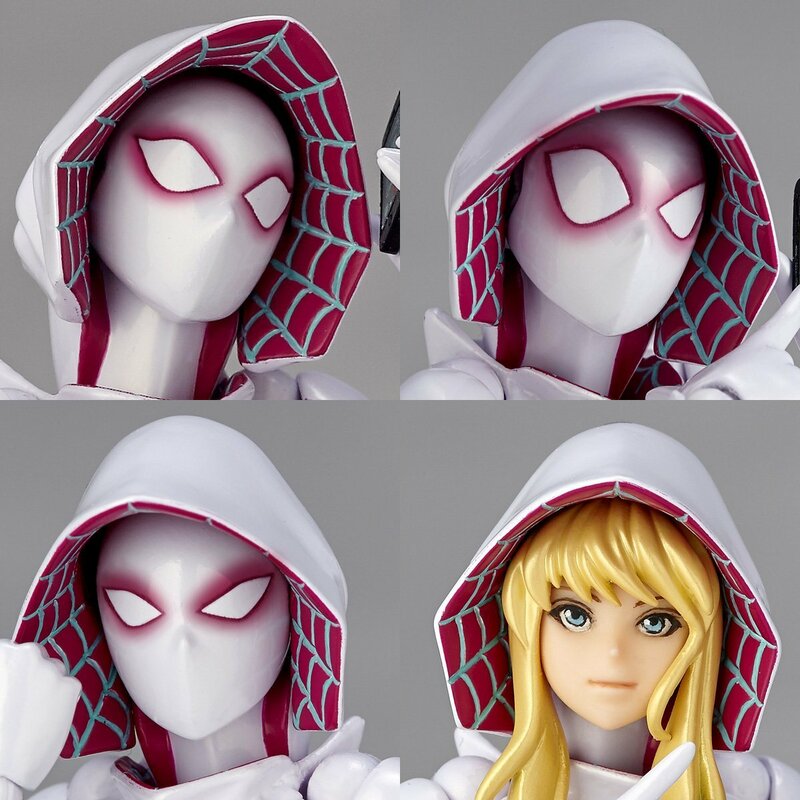 I was super excited for the Revoltech Spider Gwen until I saw the face sculpt. 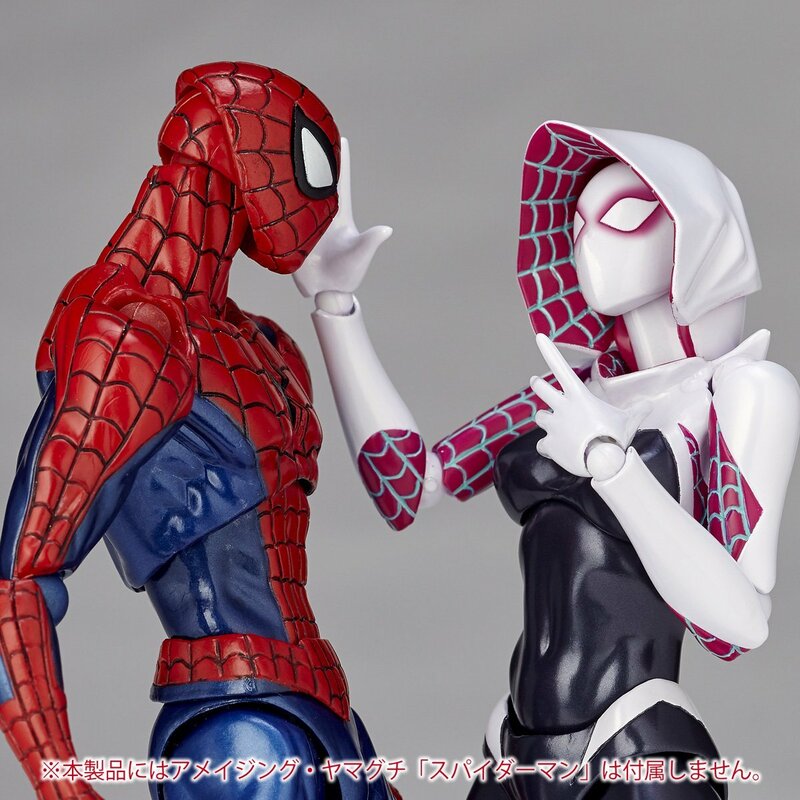 That looks way too anime, and nothing like Gwen Stacy. Very disappointing, I mean that face could be anyone. Wish they would have gone a little more realistic. How do you make an animated face more realistic? Make it a comic book face? You see the dilemma? COuld care less about female characters like most of us, but Wolverine looks like a winner. Looks to be Jim Lee style also due to the pads. Revoltech is really doing something special here and I am completely a fan. Let me just say that I'm not among those people, female characters are awesome. It's just lazy genderswaps I don�t care about, even if their costumes are pretty. And to be fair, there is apparently a fun comic series behind her, it's just that I'm not interested since the whole idea behind "Spider-Gwen" simply sounds boring to me. but Wolverine looks like a winner. Looks to be Jim Lee style also due to the pads. Revoltech is really doing something special here and I am completely a fan. That I can agree with though. There are many covers of Spider Gwen that feature a much more realistic look, or atleast comic accurate. This face sculpt is pure Anime. Look at the Wolverine sculpt, does he look Anime to you? 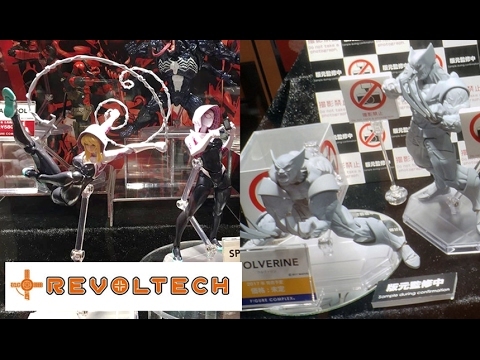 Revoltech has no consistency in there own lines. Buying Ultron ruined me for Revoltech. Sweet looking figures, but I know I'll never pull them off the shelf to pose them, because the joints are so different from everything else out there. I feel like I'm fighting to get the pose I want to get, instead of it being easy like with SHF, Figma, Mezco, or even Marvel Legends. Between the funky way the joints move and how easily they pop out, I'll pass. I look forward to seeing pictures people take of this one. She looks great! Revoltech figures have some of the most anatomically-correctly constructed shoulders in any action figures ever. Human arms are not connected to the torso on the sides of the torso. They connect at the top, at the clavicles and scapula. And having been spoiled by the way Revoltech does shoulders, I can never really get over how domestic figures do their shoulders: they look fine when rested, but once raised over 90 degrees, they just don't look human anymore. Think it mostly comes down to familiarity, preference, and priority. People who collect Revoltech can overlook the massive gaps all over the figures, because they prioritize being able to pose figures in more anatomically correct ways. People who like ML (for example) can overlook the anatomical errors (like how thick double-jointed knees look when bent, and the aforementioned shoulders), because the sculpts are more seamless and joints more hidden. Have you seen Figuarts new SFV line? Ryu and Rashid have pretty game-accurate faces, while Chun-li basically has what amounts to a paper mask with the face of a typical manga-girl printed on top. Cammy seems to be suffering the same fate, if the grey prototype is any indication of the final product: circle for a face and a tiny bump where the nose will be; barely visible sculpts for eyes and mouth. This Gwen's face sculpt is honestly quite a lot better by comparison. At least you can tell they sculpted her mouth. This character is fairly new, and I did read the arc where she was introduced. Pretty popular pretty quickly. She was popular very very quickly. The costume is pretty awesome. 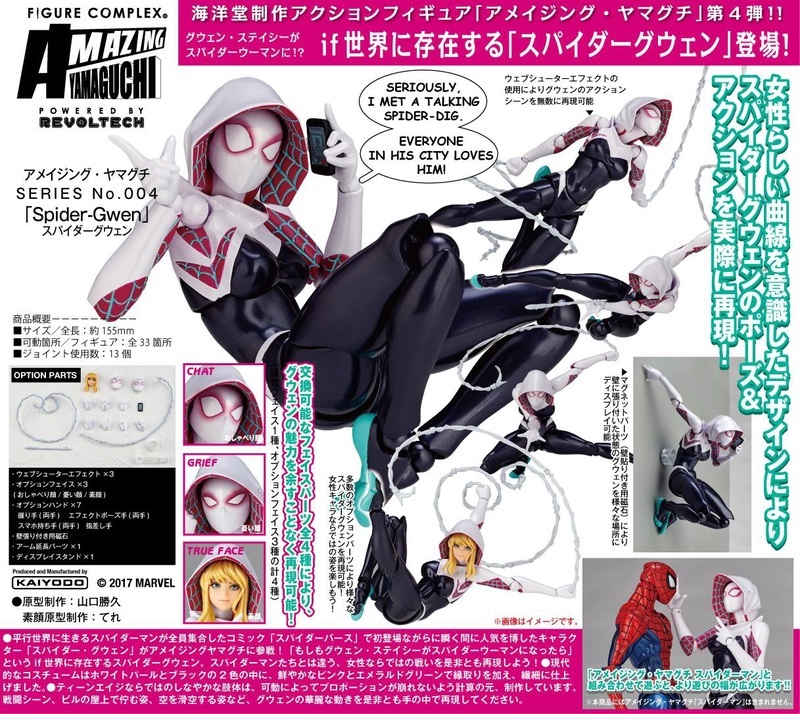 Spider-Gwen will be released in June. And dear lord her shoulder and knee joints look terrible once exposed. Revoltech strikes again. Also, I think they meant "Spider-Pig", not "Spider-Dig". Although maybe a mole with spider powers I don't know about exists in some weird Marvel universe. Wouldn’t surprise me all that much really.